In this case, I mean winter isn't over. A recent cold snap brought over a foot of snow to Mt. Bachelor and two feet to Timberline, just in time for their finale weekends. Of course at Timberline it's more of a soft close since they'll still be running, but you can't use your season pass or spring pass after Memorial Day. Both resorts have plans for their weekends, final or not. This storm keeps up and they're gonna have to change that graphic. 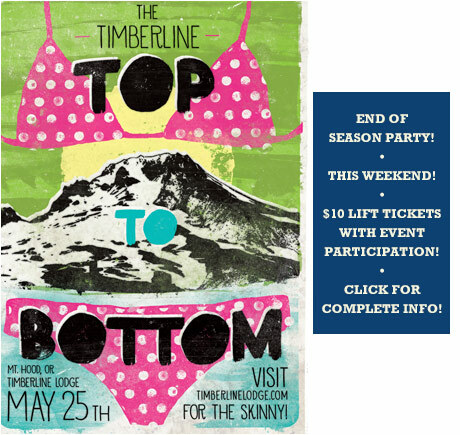 Timberline is having their inaugural Top to Bottom Race. If the storm lets up soon enough to clean off Palmer it will be a team race from there to the lodge. That in itself would be boring, so they're throwing in some bonus tasks including 'Double Dare'-style contests (I can only assume the mean the 'physical challenge' [bonus points if you actually remember 'Double Dare' the Nickelodeon family game show]) to shave time off your race clock. Sound like fun? Assemble your crew and head to timberlinelodge.com for the deets. Had to reschedule Matt Damon, didn't have time to fit him in. Down south at Mt. Bachelor, they've got a whole grip of events going on. If you know anything about Bachelor, you know they're developing a rep of having killer contests, especially in the springtime. If you follow the boredyak instagram feed you may have already seen killer pics of the Gerry Lopez Big Wave Challenge. Well, that's not all they got. It's closing weekend and they have to cram all they have left into the last two days. They've got a two-day brewfest for the adults with live music both days (remember that new stage they got? ), a ski contest Saturday and the North American Pond Skimming Championships on Sunday. Hope that's enough to keep you happy 'til November. 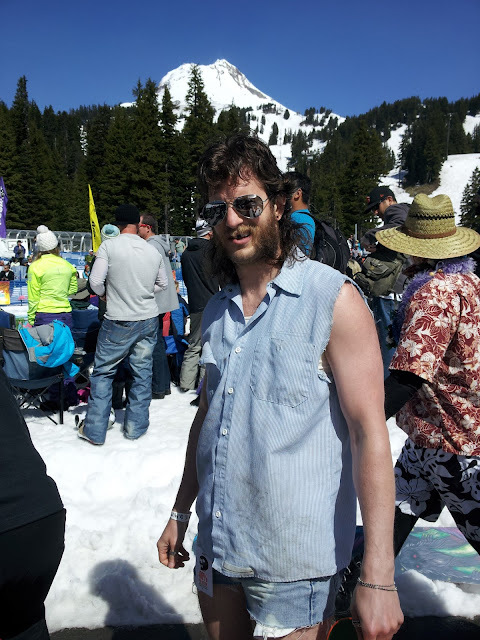 Holler if you see this guy. He's a pond skimming master.